You asked for it, and here it is! A stylish recycled cotton tote to take with you to your local farmer's market or grocery store or to simply carry around your daily "things". Embellished with the iconic historic courthouse design along with a black-eyed susan. Slide your pen in the holder at the top too for quick note jotting. Bags are made of 8 oz. 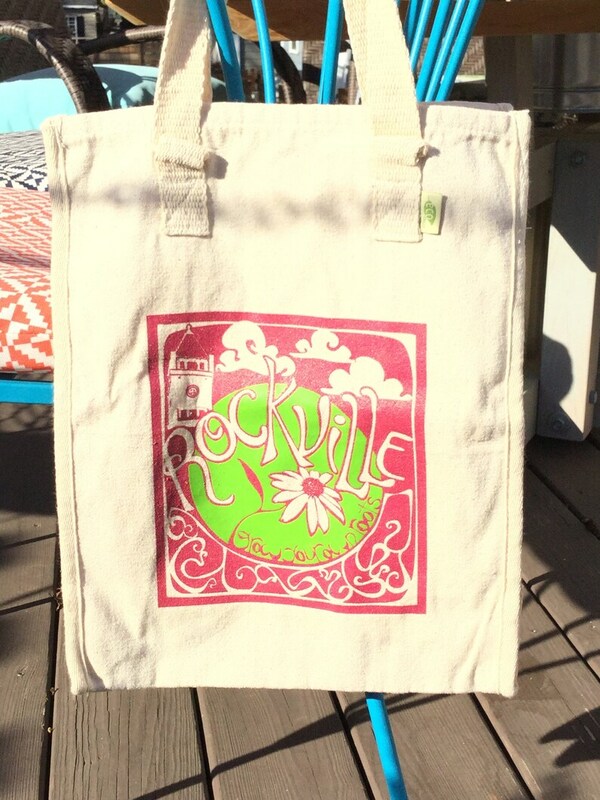 recycled cotton (85%) with sturdy 22" handles for carrying over your shoulder. Dimensions are 11"L 15.5"H 6"W.
Enjoy and collect them all! Wow! I contacted Cary for a special order. I loved her Polaroid prints so much I wanted a larger size so it could be the focal point in my dining room. Cary took time to look at best options to make this happen. The result: more stunning than I could have ever imagined. Great communication throughout the process, really listened to what I wanted. Just beautiful. Thank you Cary - will send some pics soon. So elegant! This is my go-to house gift! For a wedding gift, I add a set of the coasters. I wanted to give these as a last minute hostess gift and the seller went out of their way to expedite the shipping of this order for me. Also - The coasters are beautiful and of great quality. Please use Paypal for payment. You can use your credit card and it's super easy! Payments made within 48 hours of completing your Etsy transaction are greatly appreciated! I stand behind my work. If you ever have any trouble with any item you have purchased, please let me know right away and I will do whatever I can to help you. Refunds and exchanges are done on a case by case basis, and items must be returned in original packaging. I will accept returns for damaged or mis-shipped items, but they must be made within 5 days of receipt of merchandise by calling (434) 971-7765 and must be paid by the customer. Customer will not be billed for shipping fees to replace damaged or mis-shipped merchandise. Custom orders may not be exchanged or returned for a refund under any circumstances due to the personalized nature of the items. Every care is taken to ensure that custom orders are created according to the client's wishes. Items will ship within 3-5 business days of cleared payment and are sent using USPS. Please note that each card, print, journal, coaster set is made by hand and will sometimes vary slightly. If you have any questions or a custom request, please convo me. Also, for orders feel free to leave me a note in the comments section of your check out page. ByCary items are currently carried in several stores and is seeking to expand this list. Please email me at cary@bycary.com with your name/shop name, location, and the nature of your business (gift shop, internet shop, card store) for wholesale and ordering information.